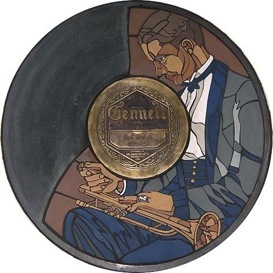 February 1st in Gennett History, 1926: Bailey’s Lucky Seven recorded “(What Can I Say) After I Say I’m Sorry” in NYC. It appeared on several 78s under various pseudonyms including Gennett 3243, Champion 15067, Aco G-16008, Coliseum 1912, Guardsman 1908, Beltona 991, and Scala 768. The track featured Red Nichols (c), Bobby Davis (cl/sax), Benny Krueger (sax), Lucien Smith (sax), John Cali or Tony Colucci (bjo/gtr), and the Tremaine Brothers (vox). Video | This entry was posted in February, Gennett, Gennett Walk of Fame, Video and tagged Aco G-16008, Bailey's Lucky Seven, Beltona 991, Benny Krueger, Bobby Davis, Champion 15067, Coliseum 1912, February, Gennett, Gennett 3243, Gennett Discography, Gennett Records, Gennett Walk of Fame, Guardsman 1908, John Cali, Lucien Smith, Red Nichols, Scala 768, The Tremaine Brothers, Tony Colucci. Bookmark the permalink.